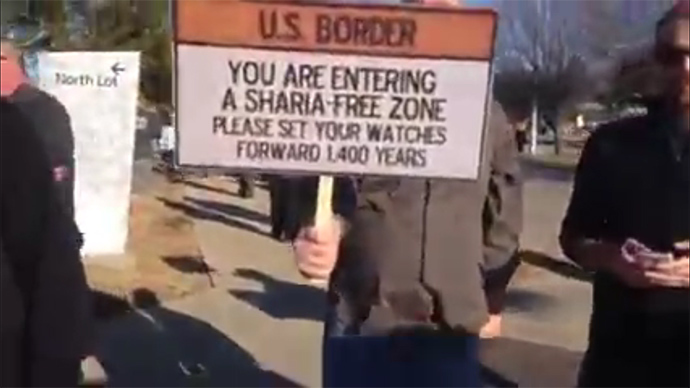 Crowds of people showed up to demonstrate outside a Muslim event in Garland, Texas. Critics of the event accused organizers of trying to stifle freedom of speech, while supporters insisted that Islam is being misperceived in America. Thousands of demonstrators gathered outside the Curtis Culwell Center, which is operated by Garland Independent School District, reports NBC DFW. The crowds started assembling hours before the conference began. The event was titled, “Stand With the Prophet Against Terror and Hate,” and was aimed at disproving negative perceptions of Islam and Muslims in the United States, according to organizers. Probably, the crowd waving American flags and holding placards, some of them referring to resent terrorist attacks in Paris, France, are among those this message is aimed at. Organizers of the event, including Sound Vision, an Illinois-based website about Islam, blame media portrayal of Islam and Muslims in the wake of the 9/11 terrorist attacks for the sharp increase of negative attitude towards them in the US. “Hate groups in the U.S. have invested at least $160 million dollars to attack our Prophet and Islam. Isn’t it time we invested in defending our faith? Otherwise, groups like ISIS and Boko Haram will only continue to increase the media’s ammunition to incriminate Muslims,” the website stated, announcing the conference. The conference was billed not only as an awareness-raising endeavor but also as a fundraiser for a communication center, which would “defend Prophet Muhammad, his person, and his message”. The protesters however see the agenda in a sinister way, believing that it is actually about silencing any criticism of Islam. One particular irritant for the protesters was the inclusion of Siraj Wahhaj, imam of Al-Taqwa mosque in Brooklyn, New York, among the key speakers at the conference. Wahhaj is a controversial figure due to a link to the 1993 World Trade Center bombing. Opponents of the conference call him an “unindicted co-conspirator” of the attack, because he was one of some 170 people closely investigated for possible involvement but never charged with any crime. He was also a vocal critic of the FBI and CIA at the time, calling them “real terrorists” in the bombing plot. Attenders of the conference in Texas deflected the accusations. "They want for people to see that we are kind, peaceful people," a Muslim woman wearing a headscarf told NBC DFW. "We're not here to fight, we're not here to argue. We're just here to show that we're Americans too." While several verbal clashes erupted between the two demonstrating camps, Saturday went peaceful and heavy police presence proved to be an unnecessary precaution. Garland Independent School District distanced itself from the controversy, when opponents of the conference accused them of endorsing the event by providing the center. The authorities said they just rented the facility and neither promoting nor discouraging the event. The tense if non-violent stand-off over Islam in Garland comes days after President Barack Obama urged European governments to do more to assimilate their Muslim minority populations. The comments came as Europeans are coping with the aftermath of terrorist attacks in Paris, where a group of Islamist gunmen went on a rampage killing 17 people, most of them during the initial massacre at the satirical weekly Charlie Hebdo. The attacks prompted massive security response across Europe, resulting arrests in several countries and a reported thwarting of a jihadist attack on Belgian police officers.